OSUN STATE, OSOGBO, OJA-OBA — A Press conference for the 2018 Osun Osogbo Festival was held on Wednesday, August 8, 2018 at the Palace of the Ataoja of Osogbo, HRM Oba Jimoh Oyetunji Olanipekun Larooye II. Given the citizenry of Osogbo's respect and love for their culture and tradition that they hold in high esteem, chiefs of the land led by Ajagunna of Osogbo, High Chief Gabriel Oparanti, members of the Osogbo Cultural Heritage Council (OCHC), Iyalode of Osogbo, High Chief Awawu Asindemade and devotees of the festival joined various recognized international media houses, corporate sponsors, men and women of the press in attendance for the press conference which was facilitated by the official Marketing Consultant of the festival — Infogem Limited. The 600 year old festival whose consistency validates it's being a newsworthy event will have its 2018 edition sponsored by Goldberg Premium Lager Beer, MTN Nigeria and Seaman's Schnapp. Otunba Ayodele Olumoko, Chief Festival Consultant and General Manager, Infogem Limited gave glory to God and appreciated the Ataoja of Osogbo land. 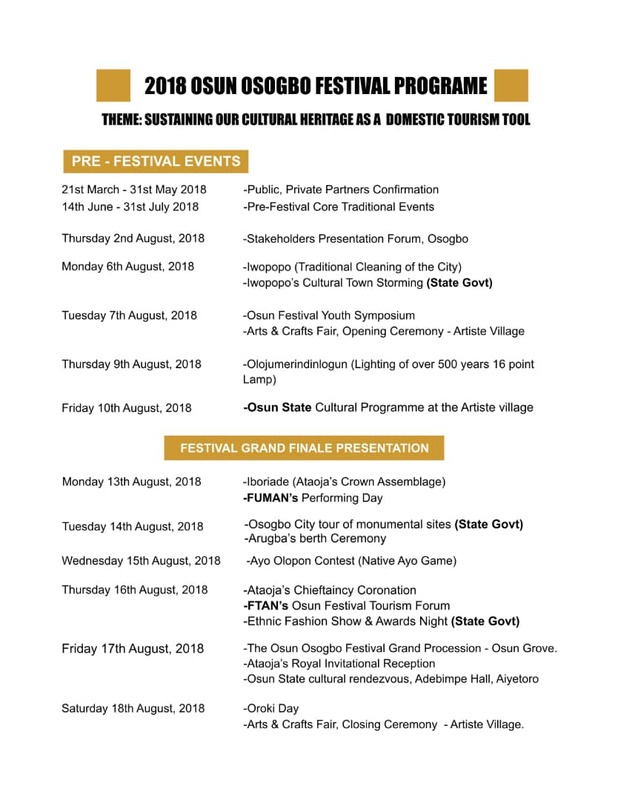 Olumoko said this year's Osun festival is being done almost with next to nothing but we thank God for the corporate organisations who are here today. He appreciated Nigeria Breweries (makers of Goldberg) and Seaman's Schnapp for well over decades of supporting the Osun festival and also MTN Nigeria who despite all the odds happening in the company, found the need to be part of the historic event. Olumoko lauded the Ataoja of Osogbo for his role that brought about the possibility of MTN's support for Osun Osogbo Festival 2018 and gave opportunity to the corporate organisations to tell everyone how they are going to leverage on the event. Representing Nigerian Breweries Plc, Mr Tayo Adelaja, Public Affairs Manager, South-West addressed attendees in the stead of Mr Kufre Ekanem, Corporate Affairs Adviser, paid homage to all those who have struggled, sacrificed and worked hard to ensure the preservation of this institution of culture till this day. “For the sixth year running, Goldberg will be part of the Osun Osogbo Festival as the Official Beer Sponsor in the category. In our usual tradition, Goldberg plans to create a memorable beer experience that will excite and reward its loyal consumers and indigenes of Osogbo town. “As part of this experience, Goldberg will uplift the town with exciting communication materials. We also plan to activate a 21day Goldberg Beer Village where the people of Osogbo and visitors will be exposed to an unforgettable beer experience with lots music, comedy, traditional events and rewards. He added that this corporate partnership will not only enhance the commercial activities in the town but will increase trade transactions especially at the beer village where thousands of visitors will be visiting daily thereby impacting to the economy of town and state. MTN Nigeria expressed great pleasure to witness yet another historic celebration of the Osun Osogbo Festival. The Regional Service Manager of the biggest ICT company in the country, Mr Bajo Onafuwa said the company feel responsible to support the core traits of the Nigerian people; our arts and rich culture. 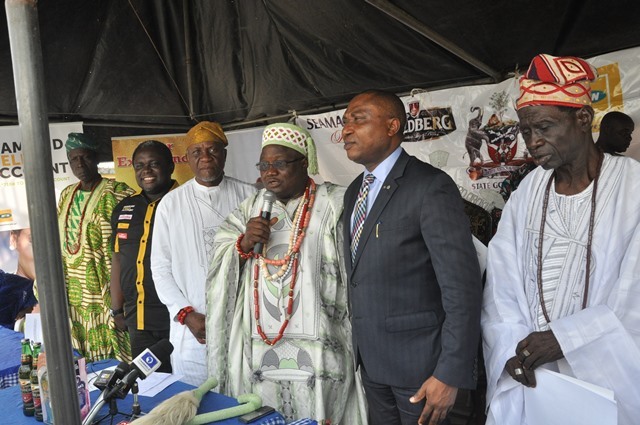 “We are proud to be supporting the Osun Osogbo Festival today as it is a key celebration especially in Yoruba land. MTN's support of the festival is part of its larger initiative—KultureFest, to create positive impact on the country's socio-cultural landscape through its support of Festivals across the country. “The initiative is borne out of the desire to preserver and project the country’s rich cultural heritage. “It puts various cultural festivals in the country on the international pedestal and also galvanises their potentials to generate revenue for the communities and engenders community bonding. “MTN has facilitated the renaissance of arts and culture in Nigeria and through its KultureFest initiative, has evolved into a strong pillar behind major festivals such as Osun Osogbo, Ofala Nnewi, Argungun, among others. We are optimistic that the Festival will further crystallize the superb experience of Nigerian Festivals, and we believe there are brighter times ahead for the Nigerian culture. He added. Brand Manager, Seaman Schnapp , Mr Bojuwade Adebowale said the company has been a conveyor of blessing and for this year we have a lot of activities lined up. “We have lots of activities for visitors and tourists that will be coming for this year’s festival. “Having partnered with the organisers of the festival for 29 years, we pledge to unflinchingly support the event and ensure its continuity remains. Olumoko said that as long as this three companies are concerned, they will always continue to to support the festival. He however, made a clarion call to the Federal Government to try as much as possible to look into the cultural values of Nigeria. “look at how to develop culture and tourism in the country” was quoted as saying. Olumoko who is also the Vice president of Federation of Tourism Association of Nigeria(FTAN) added that the FG should support to ensure our culture really thrives and also provide enough security to ensure lives are safe.